Harley-Davidson 100cc Baja. Wasteland bred for a single purpose. To rough it. 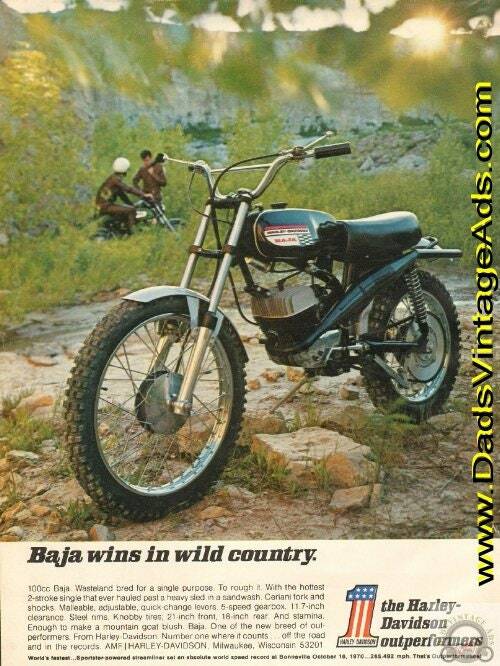 with the hottest 2-stroke single that ever hauled past a heavy sled in a sandwash. Ceriani fork and shocks. Malleable, adjustable, quick-change levers. 5-speed gearbox. 11.7 inch clearance... Steel rims. Knobby tires 21-inch front, 18-inch rear. and stamina. Enough to make a mountain goat blush. Baja. One of the new breed of outperformers. From Harley-Davidson. Number one where it counts...off the road and in the records.